Wendell Safely Finishing One Tree! That could have been the headline if I were ignorant. Maybe that sounds mean, but I don’t intend it to sound that way. 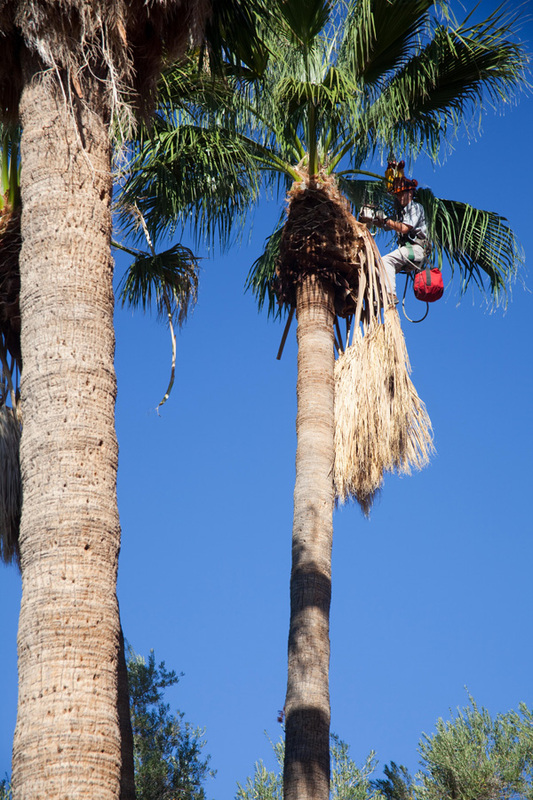 There are tree climbers killed every year trimming overgrown palm trees and there is no reason for it! We know that old fronds can break loose from the trunk and slide down, suffocating anyone on the tree below the dead fronds. There is no reason anyone should climb up under a large number of dead fronds if they are thinking clearly! Of course we usually use the lift to trim ALL palm trees, overgrown or not! With the lift we start at the top and cut down – any loose dead fronds fall harmlessly to the ground! We have successfully trimmed palms with 20 years worth of dead fronds accumulated on their trunks – killer trees! But, there are a few (very few!) trees that we can’t access with the lift. In these cases, our second choice is the 40ft extension ladder – that will get most of them. But, some trees are taller than that. As long as there are only a few years worth of dead fronds on the tree, they can be safely climbed with spikes. Two California Fan Palms (Washingtonia filifera) that were not lift accessible, were too tall for the ladder, and had many years worth of accumulated dead fronds. It looked to me as if a crane could reach the heads of the palm trees, so I asked the operator to check it out – yes, he could! So, we scheduled the job! The crane would hoist a climber to the top of the tree, and the fronds could be cut just as they would be from the lift. That was the plan – in reality, it was pretty awkward dangling from the load line, and trying to cut dead fronds with a chainsaw. It worked, but we could only do about half of each tree before needing a break to come down and restore circulation to our legs! I did the first half, and Wendell did the second half of each tree. It was a safe solution to our problem and got the trees in a condition where they can now be trimmed annually (and safely!) from spikes. A note of caution is in order (like usual!)! 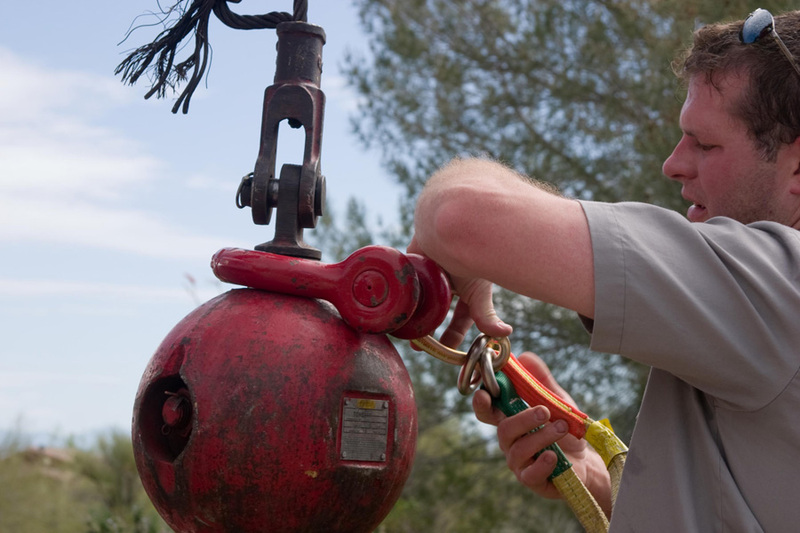 We use a system to attach the climber to the crane loadline that is described in the Tree Care Industry Association publication “Best Management Practices for Crane Use in Arboriculture”. We have used this system since seeing it in the publication when it first came out in 2008. Tying into the hook of a crane is not safe and should not be done! Yet… we have not seen anyone else in the valley using this system, nor have any of the crane operators that we deal with. Please know your stuff, people! an expert and I don’t have to worry about you! Wow Paul! That looks like it could be exhilarating! Much more fun and less nerve racking then on spikes. I guess you can imagine it! I think, actually, spikes would have been easier (at least the trimming part) because you would have some leverage. The old fronds made it too “iffy” this year, but it will be spikes in 2012!